(Community Matters) Another note from a former SW Key employee who found my blog postings on East Austin College Prep. Eugene, you are on the right track. I worked at Southwest Key Programs years ago and never spoke negatively about them in public but I am sure you are making them nervous by bringing their underhanded practices to light. You are pulling a thread that the community deserves to have pulled. When they broke ground on the school, providing community children with a quality education seemed to be the driving force behind their efforts. Reading about what is going on now it seems the Southwest Key administration is doing whatever they can to add grade levels and generating revenue for their operating expenses. Transparency seems to be and should continue to be your objective. I hope public pressure can be applied so everyone can find out where the dollars are going. Occurs to me. I have not vetted these notes. Posting without confirmation. Just wondering if anyone had updates on EACPA’s latest board meeting? Juan Sanchez will soon take over the Jain Lane campus as superintendent or in some other official or unofficial capacity. The Jain Lane (sw keys) campus was given virtually no support this school year bc district leadership could not properly lead two campuses no matter what they may clame. It had a principal and teachers but no other full time administrators or specalists. All other staff has other obligations at the MLK campus and/or district wide duty. The superintendent and his consultant(s) spent >95% of there time at other campus. Over 70% of the tutors were stationed at the other campus. Tutor coordinator had no experience (was a tutor last year). Superintendent secretary had no education experience (was a tutor last year). Even now, the MLKs campus has two full time disciplinarians to help there principal, no other duties assigned to them, while the Southwest Key campus remains with only the principal, a handful of tutors, and part time administrators with other district wide duties. At the previous board meeting, two people were allowed to attend closed executive session in violation of the open meetings act. The superintendent is currently shifting all blame to the southwest keys campus principal and claming no knowledge of the goings on at that campus despite his position as superintendent. Students at the southwest key campus scored at the 2nd grade level in September on their stanfour tens test. No wonder so many failed the STAAR test. Even after scoring at the 2nd grade level, no resources were shifted to southwest key. Instead three techers were removed over christmas break. The tutors and “consultants” (some of who receive money but never do anything) remained at MLK. The southwest key principal will be their scapegoat. Certain people know the truth how 3/4 resources were at mlk, how teachers at sw key campus received no instructional support beyond there one administrator, how the superintendent and consultant(s) approved 5th grade departmentalization in August but then fakd ignorance once it became unpopular, how all the attention went to mlk, etc. 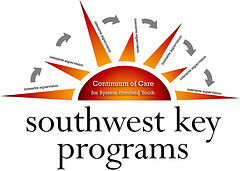 Southwest keys campus had 100% new students fresh from Austin’s isd and they did not receive the attention all year although repeated requests made from southwest key campus’ admin and teachers. This is undeniable. Just look at staff allocation today, yesterday, in december, in september, etc. An at risk campus requires first teachers at a 25-1 or lower ratio (6th grade is at 31-1 right now), it requires teacher assistants, it requires instructional specialists, it requires counselours, it requires assistant principal(s), it requires coaches, etc. Test scores = accurate reflection of resoucrses devoted to the campus despite heroic efforts on parts of teachers and principal. Exactly what we thought, Dr. Sanchez is finding every way possible to take over EACPA. The school scores are not a reflection of the superintendent. It’s a reflection of the hold Southwest Key has on EACPA. They are the ones who cut the budget, and dismiss teachers. It’s also not the principals fault. You are right the student came in not performing at their grade level. Once again the number of tutors and teachers is all depent on the budget. patents as myself voiced our concerns at Board meeting, and they were not acted on. So please don’t try to misguide the community by redirecting the short falls of EACPA on the administration level it still fall under the lack of leadership of the EACPA school board. Dr. Sanchez just need to stop trying to illegally manage EACPA so they can flourish. Yes, we know that the administration did the best they could in the face of southwest key’s pressure. It may seem that Dr. G or principles were in the wrong but as a parent that was at the campus every day in the fall semester, I can tell you that the budget cuts came from southwest keys. I still do not understnad how southwest key can possibly have a say in the budget of the school??? I trust Dr. Gonzales but I know that if he fought everything, Southwest Keys would just fire him and continue what they were doing, only worse. Incase your interested.. Even though Dr. Juan Sanchez resigned from the EACPA board at the beginning of the month, he continuous to take control over the decision that affects EACPA. Earlier this evening, I was given an update regarding the vacant elementary principal position at EACPA. Vacant not much longer if Dr. Sanchez gets his way. It seems Dr. Sanchez, Dr. Gonzales, and southwest key personell met with a potential candidate this week. After the meeting Dr. Sanchez offered the position to Dr. Priscilla Terranza from El Paso. What I’m trying to understand is if the Eacpa charter states the hiring of the principal is the specific responsibility of the superintendent why is Southwest Key and Dr. Sanchez involved. EACPA should have had a committee of various stakeholders like they initially planned for the principal interview process. I am a parent with a child at the Jain Lane campus. I chose the school because I liked the globaloria and soundwaves program and was impressed by the committment to the students and small class sizes. Teachers and administrators asre hired at will, there don’t appear to be contracts in place. The Jain Lane prinicpial, Sal Vega, was just let go and the school has called a series of meetings with parents this week. There appears to be an internal struggle in the organization that threatens to undermine the school and student’s academic progress. I am growing discouraged and am concerned that the Ms. Terrazas that is mentioned is the same one that was linked to the academic cheating scandal in El Paso.